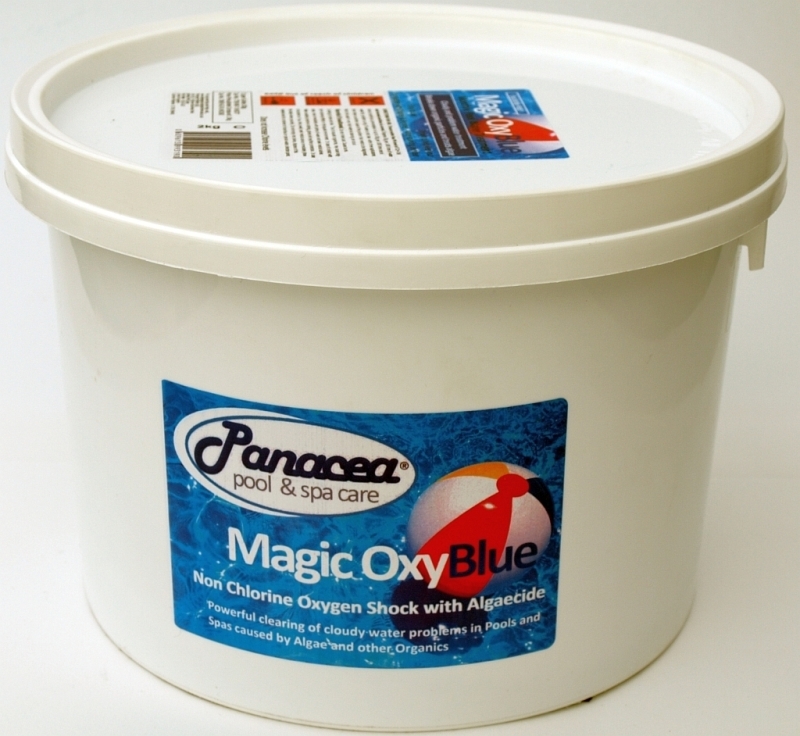 Our Brand "Magic Oxyblue" As with our OxyShock product contains dupont Oxone peroxymonosulphate. In addition magic oxyblue contains a long acting algaecide plus a ph buffer to help counteract the natual ph changes that peroxymonosulphate tends to cause. Regular shocking is the secret to sparkling clear pool water all season and through the winter. And, with the addition of an algacide and buffer it becomes an all in one product. After killing algae with shock levels of chlorine, add oxyblue as a claryfier to destroy the dead algae and on a regular basis to stop the aglae returning. Choose OxyBlue chlorine-free shock oxidiser that contains DuPont™ Oxone®. You’ll get all of the oxidizing power of a chlorine shock to help keep your pool water safe without over-chlorinating. Your pool water will be sparkling clear, free of harsh chlorine smelsl, and you won’t have to wait more than 15 minutes after application to get back in the pool. Regular use kills algae and negates the use of a separate algaecide. Without regular oxidation with Magic OxyBlue, organic contaminants will continue to build up, potentially consuming sanitizing chemicals such as chlorine or bromine faster than they are being supplied. When this happens, water quality begins to deteriorate, algae can develop, or the water can become dull and cloudy. Most importantly, adequate protection against disease- and infection-causing micro organisms is difficult to maintain, and bather health cannot be assured. Magic OxyBlue is a powerful, chlorine-free product that uses the power of active oxygen to eliminate organic contaminants from swimming pool water. It’s available as an easy-to-use, quick dissolving powder that goes to work immediately & it does not reduce chlorine levels. Plus, bathing can ressume shortly after application unlike several days of waiting for chlorine levels to return to safe normal levels as is necessary when using chlorine as a shock.